Amazon allows shoppers to add products they're viewing to a saved "wish list" so they can refer to them any time - when they have more time to shop, for example. A new "Save an idea. Shop for it later" feature allows shoppers to save general items to their Amazon wish lists by typing in a term without having to be on a product page. Shoppers can simply go to their wish list and type in the words "coffee mug" or "red scarf," for example, without being any more specific. That also allows them to add items that aren't available for sale on the Amazon marketplace. Since there's no product listing associated with "Save an idea. 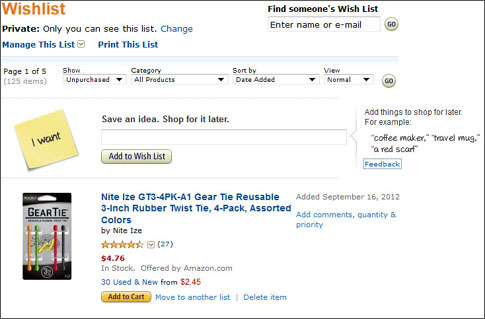 Shop for it later" items, that means there's no photograph displayed, so Amazon puts an image of a yellow sticky note with the words "I want" next to those items in the wish list. By helping shoppers save products to wish lists, Amazon and other retailers who offer such features may capture sales from shoppers who return later to see what they've saved. Amazon has an open approach to its wish list feature by allowing shoppers to use an "add-on" to their Internet browser (such as Firefox and Google Chrome), explaining, "Keep track of what you want. 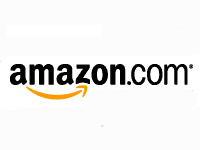 Add anything from any website to your Amazon Wish List." Amazon also allows shoppers to make comments in their wish lists, make them public or private, add quantity desired and quantity received, and even prioritize the items on their lists. Because some shoppers choose to make their wish lists public, Amazon has a search box they can use to find other people's wish lists. Shoppers can filter items in their wish lists using "Sort by," "View," "Category" or "Show" (purchase status). Amazon is collecting feedback from shoppers as it rolls out the "Save an idea. Shop for it later" feature. The survey states, "This feature allows you to save a general item that you want or need to your Wish List, even if you don't have the time or inclination to shop for the specific product at that moment. It's a virtual sticky note so you don't forget. We think this might be useful and want to know what you think. Is this a useful feature to you?" Shoppers can choose one of the following options: This is very useful; This might be useful; This is not for me; or, I don't get it.